Each Easter the craft biggie is the Easter hat for the school parade. This year I had clear orders: the missie requested white bunny ears and some eggs. For the rest I was allowed to make some decisions. So I picked an Easter bonnet in some 1 Euro shop and some blue eggs nests. The 6 nests are sewn all around the hat border. I made the bunny ears with white and pink felt and added two layers of interfacing to make sure they stand up. I embroidered the bunny nose and moustache. Colourful brads fill the empty space between nests, whereas two smaller black brads make perfect bunny eyes. I allowed myself some eastery ribbon and would have add some flowers but was instructed not to ( 🙂 ). Next year I will have to make two of them as my youngest starts school in September. Maybe HE will allow me to go wild with flowers? Wish you luck with that one! 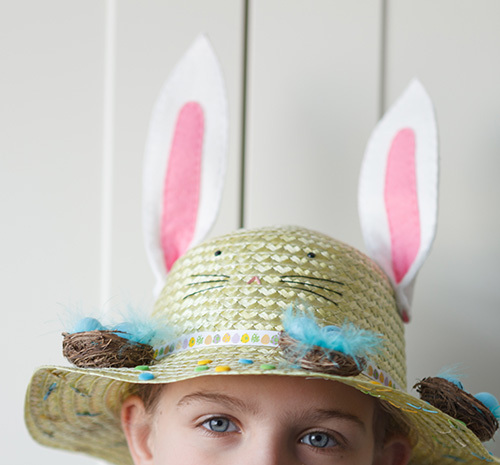 Easter bonnets with boys is a bit tricky – I speak from experience. Loving this one though. The ears are my fav bit! 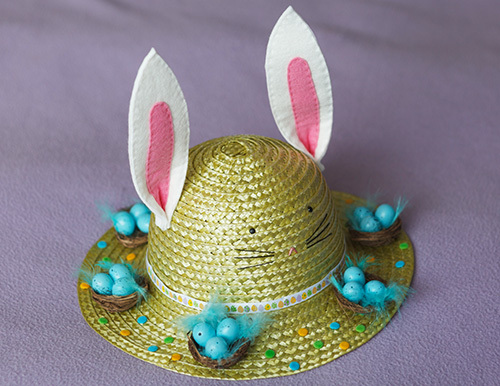 Thanks for the tip – what would boy like/accept for an Easter hat? Hmmm? Not sure that I have ever really answered that – luckily our school stopped it before mine got too old! I think maybe letting them help make it may help?